Water towers can be seen across the world. As more modern and technological forms of water harvesting have now taken their place, in many cases they’ve fallen out of use, gently degrading and serving only as a visual reminder of former times. However, visionary designers and architects are transforming old structures and occasionally creating new ones. Here are some of our favourite projects. 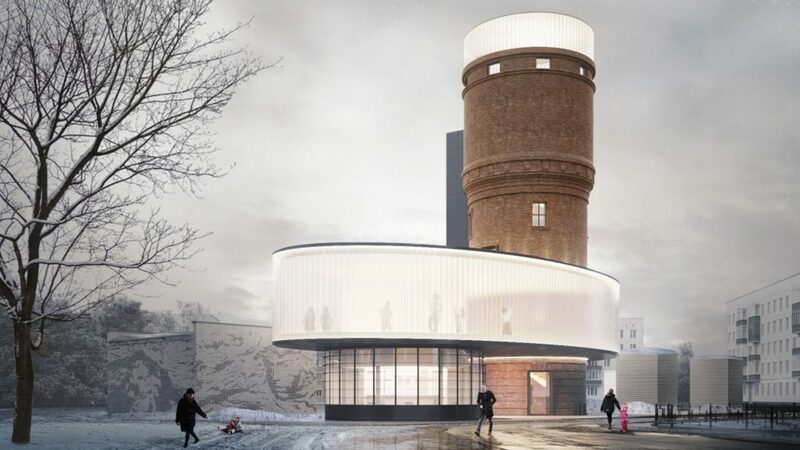 When IND Architects began work to renovate an old water tower in Shcherbinka (above), Moscow in Russia, it’s work was informed not only by the space restrictions of the original building but also its history and place in the community. 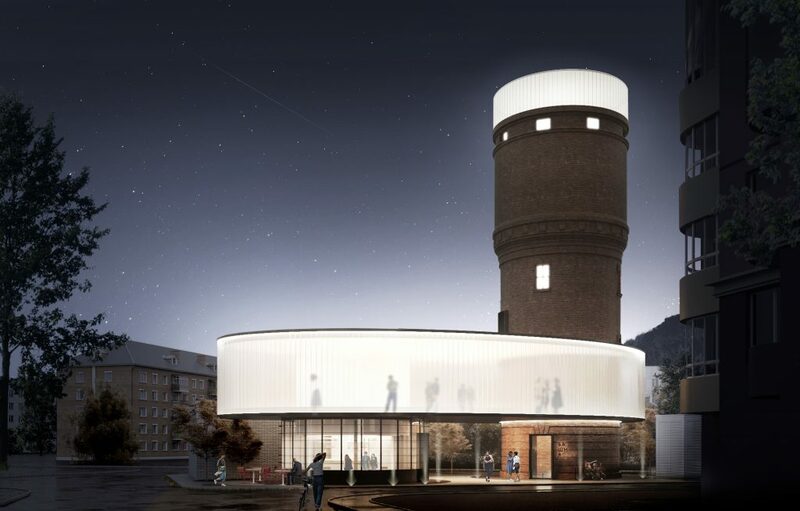 The concept was to turn the old tower into a visitor centre hosting exhibitions and events, meetings and concerts. IND wanted to use as much natural light as possible so lined the event space with opaque glass to absorb the daylight, while at night the same glass allows the tower’s internal lights to radiate a soft luminescence so passers-by can see the silhouettes of visitors. IND was founded in 2008 and its residential and public buildings can now be found in Russia, Spain, Montenegro, and Kazakhstan. 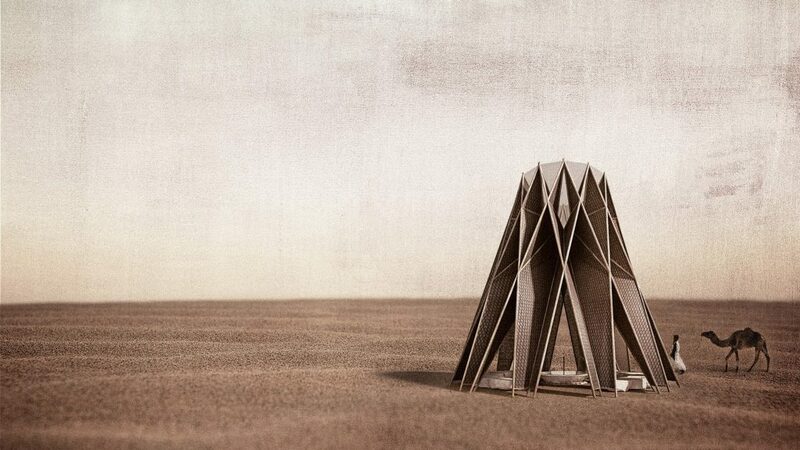 The Nomad Pavilion concept (above) by architect, designer and visual artist Dina Haddadin is designed to double as shelter and water-collecting tower for the Jordanian desert. 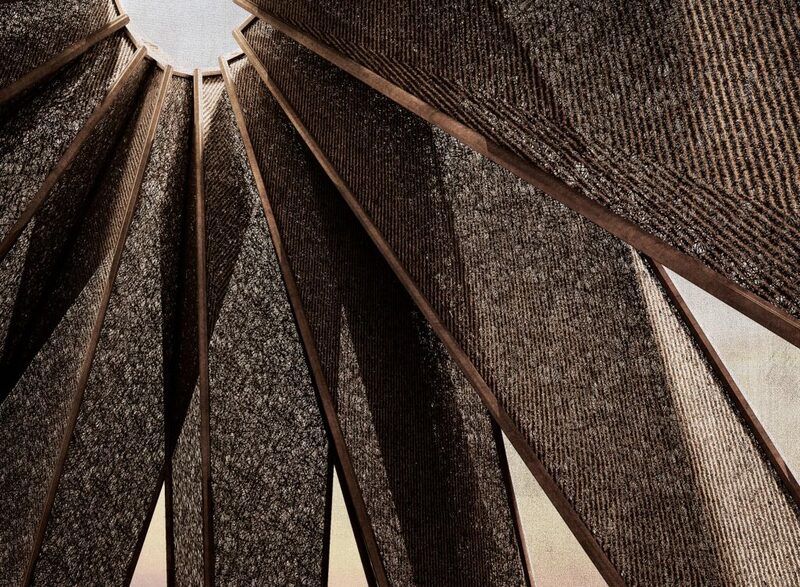 Inspired by the shape of a Bedouin tent – one of the earliest shelters to protect nomads from harsh desert conditions, the structure also references the Black Iris – the national flower of Jordan, which adapts to the desert’s dry environment, harsh sun and strong wind. Overlapping, triangular “petals” meet at the top to create a round aperture that is open to the sky and covered with a dense fibre net that allows air to escape from but is harvests rainwater and fog using a combination of hydrophilic and hydrophobic methods. The fresh drinking water is drained down hollow, steel pipes to an underground holding tank. A tent-like covering of coarsely woven goat hair is intended to provide further shade thanks to its dark colour, while the loose weave allows natural light to filter into the interior. 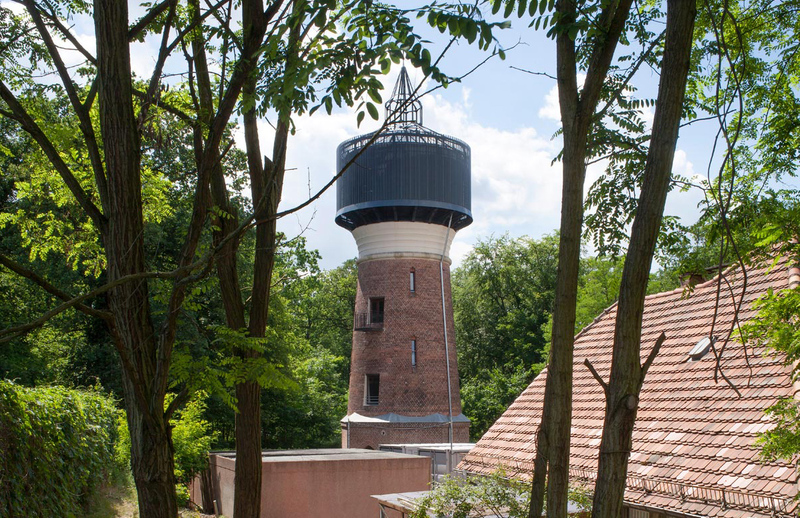 Finally, if you’d like a water tower holiday then look no further than Potsdam in Germany, which is home to a water tower that’s been given a new lease of life as a minimalist holiday retreat by architects Katrin Wirth and Daniel Alonso Gonzalez. The derelict tower in Potsdam’s wildlife park was built in 1910 to supply water to the German city’s steam locomotives, before falling out of use in the 1980s. The tower was left to decay and slated for demolition before the couple bought it in 2014 and set about turning it into a weekend retreat. Wirth and Gonzalez have retained many of the tower’s historic details, including a domed ceiling and an iron staircase. The kitchen sits on the ground floor, with three bedrooms and a living room above. The fourth floor is a ‘mini-museum’, dedicated to the history of the waterpower and its conversion, with historic trinkets (including an old water tank with original fixtures) salvaged during the building’s refurbishment. 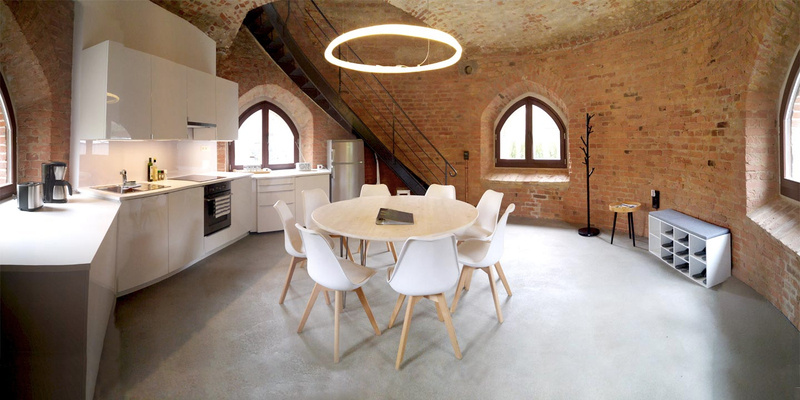 The interior is a mix of old and new industrial with exposed brickwork and beams – and visitors even have a private roof terrace that offers views over the 875-hectare wildlife park and nearby New Palace.